Plant-associated microbial interactions involve the great array of root/shoot dynamic environments known as the rhizosphere (in soil) and phyllosphere (plant aerial parts). Here, microbial communities are under multi-prolonged interactions within themselves as well as with plants to improve plant adaptation and tolerance to environmental constraints. Among the different kinds of plant-associated microbial interactions, beneficial “endophytic interactions” occur in rhizosphere as well as in phyllosphere habitats, wherein diverse group of bacterial and fungal communities colonizes plant inter- and intracellular spaces. Structural composition of endophytic microbial communities with respect to few bacterial groups and fungal species has been characterized. Identity of their large diversity and ecological functions of large majority of microbial species in the plant endophytic microbiome are remaining unknown. A variety of distinct abiotic stresses in the soil environment is known to occur singly or in combinations, causing both general and specific detrimental effects on plant growth and development. In addition to the direct negative impact on growth of the plants, abiotic stresses known to affect the rhizosphere soil as well as plant-associated beneficial microbial interactions (symbiotic and endophytic interactions) and thereby crop yield in agriculture. The so-called term induced systemic tolerance (IST) has been put forward to explain different possible mechanisms exerted by the rhizo-/endophytic bacterial and fungal- or microbe-mediated systemic tolerance against abiotic stresses in plants. 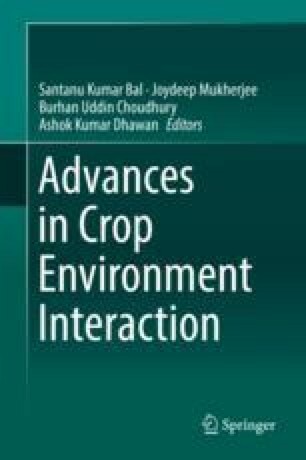 Hence, there is a necessity for redefining as well as rethinking of modern agronomic practices with our current perceptive of the significance of plant-associated beneficial microbial communities (rhizosphere, symbiotic, and endophytic interactions) for plant productivity and health under abiotically stressed environments. In this present chapter, we converse the impact of abiotic stresses upon soil and plant-microbial beneficial interactions; diversity exists in the endophytic microbial interactions (rhizobacterial endophytes, Archaea, fungal endophytes, and beneficial viruses) and their possible mechanisms including habitat-adapted symbiosis involved in promoting growth, development, and tolerance to abiotic stresses in crop plants.